If you’ve wondered what the difference is between a passport book and a passport card, you’ve come to the right place. Our guide will show you the uses and advantages of each document, and will help you figure out which one is best for you, or if you should have both! Get your Passport Processed in 2-3 Business Days! 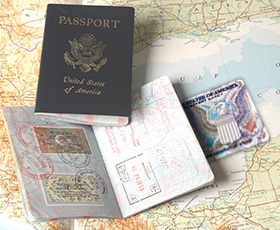 What are Passport Books and Passport Cards? Passport books are likely what you think of when you imagine a passport – a booklet-style identification and travel document. Most US passports have a dark blue cover, and contain 28 pages. Of the internal pages, 17 are blank pages marked “Visas” that are meant for travel visas and country entry and exit stamps. They can be used for all international travel purposes as well as for proving your identity and citizenship. Passport cards are a form of US passport that are the size of a credit card or driver’s license. They have been available to US citizens since 2008, and are meant to be a convenient way to prove your identity and citizenship. They can be used for land or sea travel to Canada, Mexico, Bermuda, and the Caribbean, but they cannot be used for any international air travel or for visas. Who Should Get a Passport Book? Anyone who will travel internationally by air must have a passport book. It’s that simple! If you have a valid passport book, you do not have to get a passport card as well. Your passport book can be used in any situation where a passport card could be used, but you may find that it is convenient for you to also have a passport card. Who Should Get a Passport Card? Passport cards are particularly useful for some people. If any of the following apply to you, you may want to obtain a passport card. People who frequently cross the Mexican or Canadian border by car or train. Children too young to get a driver’s license or other state-issued identification card. Non-drivers who want a card-sized identity document. Please see our pages on New Passports, Passport Cards, and Passport Renewal.